LED Type:4-SMD LED. Base Type: T10 /W2.1x9.5d Wedge Type Bulbs. Color : Purple. Pa ckage Including. We are Rover people. 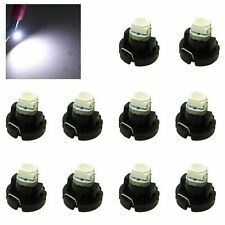 We have a New Headlamp Switch Range Classic fits Range Rover 89 - 95. Need help?. Let's chat. Rims and Wheels. Exterior Accessories. Engine Parts. Cooling System. T10 = W5W 147 152 158 159 161 168 184 192 193 259 280 285 447 464 501 555 558 585 655 656 657 1250 1251 1252 2450 2652 2921 2825 PC 175 2886X. 20 pieces Twist Lock Bulb Holders/Sockets. It will be much brighter than your original halogen bulbs, and the working life span will be much longer. This T10 LED will replace socket bulbs number : T10 W5W 158 168 147 152 158 159 161 168 184 192 193 194 501 901 904 912 916 917 918 920 921 922 923 926 927. If the LED does not light up, simply Rotating it 180 degrees (reverse the polarity). This harness is in great shape, even the bulbs work. 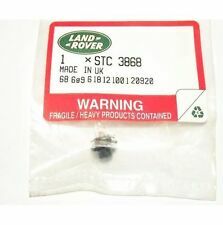 This harness will also fit all Series 1 Land Rover Discovery models from 1994-1999. This T10 LED will replace socket bulbs number :Â Â158, 161, 168, 194, 28, 3652, W5W, 2886X, 921, 912Â. 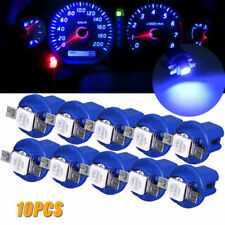 6 pcs Blue T10 168 194 Led bulbs. 6 pcs twist lock. Compatible with WLED series miniature wedge base bulbs. T10 = 194 147 152 158 159 161 168 184 192 193 259 280 285 447 464 555 558 585 655 656 657 1250 1251 1252 2450 2652 2921 2825 12256 12961 2521 2525 W5W. Base Type: T10 Wedge. 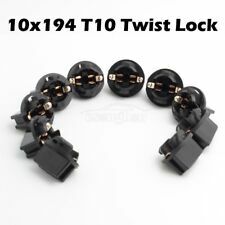 6pcs T10 Twist Lock Sockets. LED Type:7-SMD LED. Base Type: T10 /W2.1x9.5d Wedge Type Bulbs. Color : Blue. Pa ckage Including. For White T10 gauge cluster LED bulbs This T10 LED will replace socket bulbs number :158, 161, 168, 194, 28, 3652, W5W, 2886X, 921, 912. If the LED does not light up, simply Rotating it 180 degrees (reverse the polarity). T10 = 194 147 152 158 159 161 168 184 192 193 259 280 285 447 464 555 558 585 655 656 657 1250 1251 1252 2450 2652 2921 2825 12256 12961 2521 2525 W5W. Base Type: T10 Wedge. 6pcs GreenÂ T10 LED Bulbs. Ultra Bright LED, unique and more vivid color. Color: Blue. - If it doesn't light up, just flip it 180 degrees then it should light up. Note before ordering Easy installation, just plug & play. Pacakge Includes. Base Type: T10 /W2.1x9.5d Wedge Type Bulbs. LED Type:7-SMD LED. Color : 6000K White. Pa ckage Including. Base Type: T10 /W2.1x9.5d Wedge Type Bulbs. LED Type:7-SMD LED. Color : Blue. Pa ckage Including. PART # PRC5425. MASTER LIGHTING HEADLAMP SWITCH. Base Type: T10 /W2.1x9.5d Wedge Type Bulbs. LED Type:7-SMDÂ Â LED. Color : 6000K White. Pa ckage Â Including Wedge T10ÂW5W W3W 147 152 158 159 161 168 184 192 193 194 259 280 285 447 464 501 555 558 585 655 656 657 1250 1251 1252 2450 2652 2921 2825 PC 175 2886X. LED Type:T10 Base 8 SMD in total. Color Tempurature: PURE RED. Cross Reference: W5W 194 147 152 158 159 161 168 184 192 193 259 280 285 447 464 555 558 585 655 656 657 1250 1251 1252 2450 2652 2921 2825 906 579. Lighting and gauges may appear different depending on light entering vehicle and vehicle year, make, and model. These lights will not drain your battery. 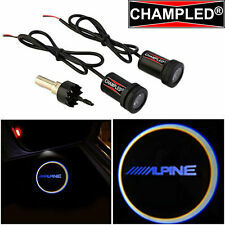 please check your stock bulb for correct position and size before placing order.If you are unsure about fitment plese ask us so we can help you! 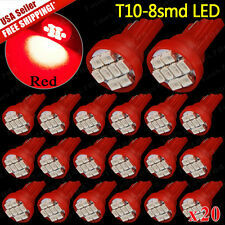 This Listing is for 10 pieces Round Red T5 LED bulbs T5 Twist lock, High quality and Brand New! Each bulbs contains Diode which are much brighter than the stock OEM yellowish traditional lamps. 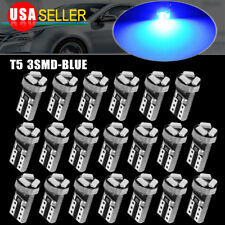 Package Includes: 10 x Round Red T5 74 LED BULBS for Instrumental Cluster Gauge 10 x T5 Twist lock . Cross Reference: T5 17 18 27 37 58 70 73 74 79 85 86 206 207 286 306 307 308 406 407 2721. LED Color: GREEN. LED Type: T5-3014-3SMD. (Ex: Amber behind seat belt/check engine lenses, red behind oil/generator lenses and green behind turn signal lenses.). Sub-Miniature wedge LED's that cross with bulb manufacturer part numbers These LED's are dimable. Lighting and gauges may appear different depending on light entering vehicle and vehicle year, make, and model. With white LEDs, gauges on this vehicle still appear green due to the green tint. This T10 LED will replace socket bulbs number :158, 161, 168, 194, 28, 3652, W5W, 2886X, 921, 912. Socket for194/168(T3-1/4 ) typeMiniature Wedge Base bulbs. Compatible with WLED series miniature wedge base bulbs. Lighting and gauges may appear different depending on light entering vehicle and vehicle year, make, and model. We have kits available in white, blue, aqua blue, green, pink, and purple. Lighting and gauges may appear different depending on light entering vehicle and vehicle year, make, and model. Way faster than traditional bulbs. Lighting and gauges may appear different depending on light entering vehicle and vehicle year, make, and model. LEDs are removable from Sockets. 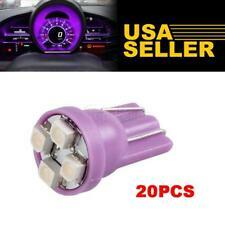 For Wedge Bulbs 194 T10 W5W 147 152 158 159 161 168 184 192 193 259 280 285 447 464 555 558 585 655 656 657 1250 1251 1252 2450 2652 2921 2825. NOTE: We do not split colors. Cross Reference: T5 17 18 27 37 58 70 73 74 79 85 86 206 207 286 306 307 308 406 407 2721. Number of Bulbs: 20 PCS. LED Color: GREEN. LED Type: T5-3014-3SMD. Wedge type LED's are polarized, if they don't light simply turn them around to reverse polarity ( -). LED's look good installed behind your gauges for better illumination. (Ex: Amber behind seat belt/check engine lenses, red behind oil/generator lenses and green behind turn signal lenses.). Looking at picture #2, you are buying the smaller socket to the right. The bulb size is shown for reference only. Do not confuse these sockets with the larger T10 194 wedge socket which fits a 1/2" hole. New in box. This is for 1 bulb. LED Type: High Power 3014 SMD, Each LED has 3 SMD in total. Cross Reference: T5 17 18 27 37 58 70 73 74 79 85 86 206 207 286 306 307 308 406 407 2721. 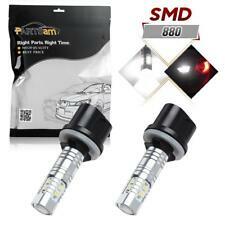 - Before you buy, Make sure the T5 Socket Type and the length of this bulb can fit in your car's lens of Housing. Part Number: 12516LLB2. H4 GAS OHV Naturally Aspirated, 4.4L 4394CC V8 GAS DOHC Naturally Aspirated, 2.2L 2197CC l4 DIESEL SOHC Naturally Aspirated, 2.8L 2746CC l6 GAS DOHC Naturally Aspirated, 2.0L 1984CC 121Cu.